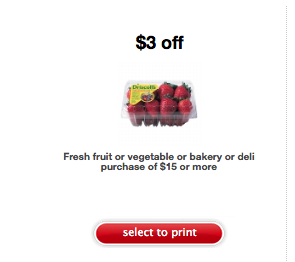 Click HERE to find a printable Target coupon for $3 off a $15 purchase of fresh fruit, vegetables, bakery or deli items. This is a Target store coupon but can also be used at Price Chopper! This entry was posted in Capital Region Deals, Coupon, Price Chopper, Target and tagged coupon, Price Chopper, Target. Bookmark the permalink.